Strategic engagement - Share best practice. Meet your peers - Networking at the highest level. Hear new thinking and explore the latest trends. Inspiring insights from external keynote speakers. Bespoke and tailored - An opportunity to build your own itinerary enabling you to participate in roundtables focusing on those subjects which matter to you. Keynote sessions geared to encouraging new thinking – typically from outside of the industry. 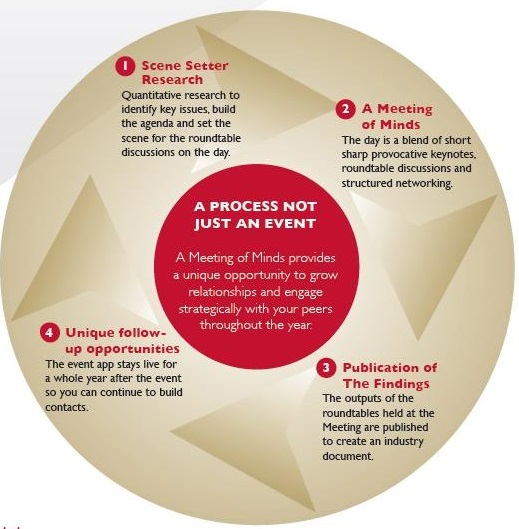 Participation at A Meeting of Minds Wealth Management and Private Banking is by invitation only. For further details please call Ciara Sala on 01483 862697 - or email ciarasala@owenjamesgroup.com.